Hidden to the west, just a short flight south of San Diego, lies a magical place where the Sea of Cortez meets the Pacific Ocean. Cousteau nicknamed this area "the world's aquarium," for its unparalleled abundance of marine life. 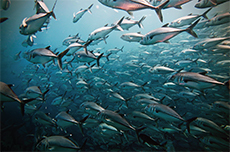 The seas around Baja California host over 900 marine species and are perhaps the most densely populated meeting grounds for migratory species in the world.